Aircraft lost part of the left engine cowling and returned to land. BULLHEAD CITY — Members of the Bullhead City Firebirds youth football team certainly have a story to tell about their trip to national competition. And at least part of the story won’t have anything to do with football. Thirty-five members of the team’s travel party — players, coaches and parents — were among 166 passengers and crew members aboard Frontier Airlines’ Flight 260 from Las Vegas to Tampa, Florida, that had to make an emergency return to McCarran International Airport in Las Vegas after part of the covering of an engine tore loose. The team is scheduled to compete in the American Youth Football National Championships Cadet Division (players 10 and younger) in Kissimmee, Florida. Their travel itinerary began with a morning flight from McCarran to Tampa International Airport. As the Airbus A320 was taking off around 7:12 a.m. Friday, part of the cowling blew off, leaving a portion of the jet’s right engine exposed. 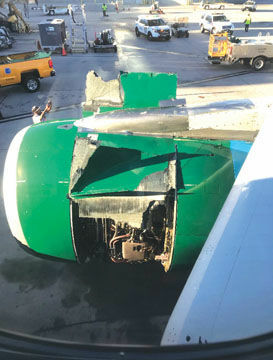 In a statement, Frontier Airlines said that during takeoff a section of a cowling — the engine cover — came loose and separated from the aircraft. The emergency landing has changed the plans of the Firebirds. Eventually, four flights were needed to get all of the Firebirds’ travel party to Florida. Two groups — a total of 18 — left Las Vegas early Friday afternoon. Two more groups were booked on flights later in the day. “We’ll all get there — eventually,” Yoney said. The traumatic experience prompted some players to reconsider going to the national tournament. Yoney said there are six players who had not flown before Friday’s trip. Joseph Yoney, the quarterback for the Bullhead City Firebirds, was sitting four seats in front of his father, Joe Yoney. Frontier Airlines said passengers were given a refund of their flight tickets plus a $500 voucher for future travel on Frontier. Frontier also is covering the full cost of re-booking the passengers on other airlines. Joe Yoney said the team’s first game won’t be until today. A meeting on Saturday was to unveil the brackets and game times. “Right now, we don’t know who we’re playing or when,” Yoney said. He said it will be a challenge to get the players’ focus back on football after the travel ordeal. The team takes a 13-1 record into the national tournament. Win or lose, it will be a lasting memory.